Musical electroencephalography is a well established field of research helping to understand the processing of musical information about tone and pitch, timbre or musical thought. This quite young field can help us to understand inner musical relations as well as cross-modal interactions between sound and music and vision, movement and thinking. 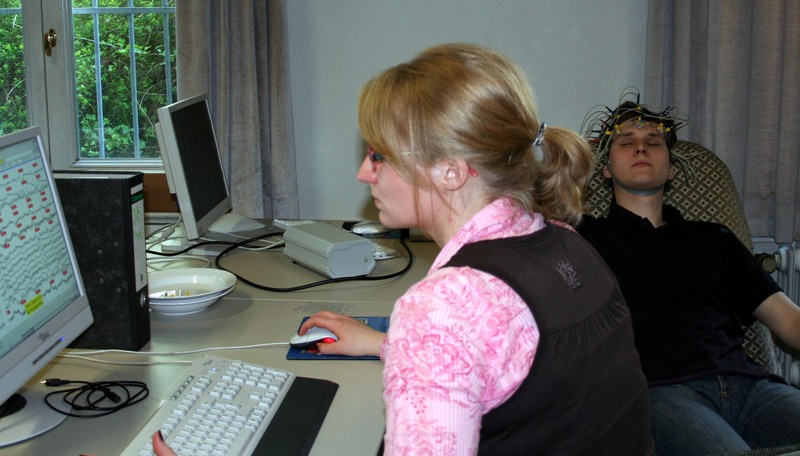 The EEG group at the institute is investigating problems in this area. Musical timbre is known to be multidimensional. The comparison between aspects of sounds and reactions of the brain can give more detailed insight into our representation and understanding of timber in our minds. Several aspects of sound are tried to connect to different brain regions and behaviour there. Among others, the most interesting are brightness of sound, openness, speed of attack or loudness. The results here are then compared to psychological tests of Multidimensional Scaling Analysis (MDS) of musical sounds, which use sounds precisely constructed by Physical Modelling techniques (FDM, FEM, ect.) of musical instruments. Musical inspiration is a complex field. A musical thought is put into music which then shows the changed ‘way of thinking’ of adjacent musical phrases. This thought is often before the change of musical performance and output. Time-dependent EEG analysis show the connections between thoughts and musical activity. These are found with musicians performing free improvisation pieces. Here a spontaneous musical thought is transferred to musical phrases. Also connections between movements of the players body, musical tones and musical ideas can be found. The question in which way a thought is applied to which change of texture can give detailed analysis, where really ‘new’ ideas are applied, where just phrases are played which are automatically ‘in the fingers’ and where a longer phrase shows up to start, have its climax and stop again.